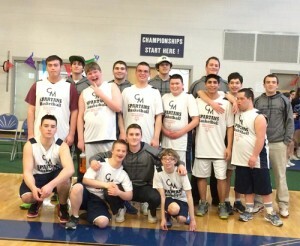 A John Wooden quote provided guidance to the Special Olympics Central Mass Spartans basketball team: “Don’t let what you cannot do interfere with what you can do.” The Spartans proved that what they could do was earn a second Massachusetts championship in the Special Olympics Winter Games. The team has 12 athletes ranging in age from 13 to 22 years old from Stow, Bolton, Lancaster, Shrewsbury, Sudbury, Framingham, Clinton, Harvard, and Northborough. All 11 of last year’s athletes returned, with Robert Wells from Stow added to this year’s roster. The games were played over March 8-9 at Auburn High School, one of the many locations hosting the games. Competing in the Brandon Bass Division (traditional seniors), the Spartans played four games against two other teams, LPS Lightning and Fitchburg ARC Celtics, sparring with each team once a day. The first game was against the Lightning, and the Spartans rallied from an 11-0 start to win 27-20. They then took both games against the Celtics 31-18 and 30-24. The last game rematch with the LPS Lightning was the nail–biter, where the Spartans once again battled from a 9-0 deficit to tie the game with under a minute left. At the buzzer, the Celtics drained a shot at the buzzer to win 27-25. However, since the Spartans had a 3-1 record and an advantageous point spread over LPS, they took home the gold medals. The highlight reel moment of the weekend was a one-handed shot from half court by the Spartan’s Patrick Kennedy that prompted his teammates and fans for both teams to stand and cheer. The key to victory was the team’s strength on defense, according to head coach and program coordinator Brendan Aylward. “The kids learned to be aggressive on defense, where to be on the floor, and different types of defense,” he explained. The Spartans began practicing right after last year’s win, once a week at Nashoba on Saturday mornings during the school year and twice a week over the summer. The road to the state games included participating in four community games at local colleges and high schools to help determine the finalists. Two weeks prior to states, the Spartans played in evaluation games at Regis College to be placed in divisions for states. In addition to focusing on offense and defense fundamentals, Aylward ran his team through aggressive conditioning routines. The Wells family, who moved to Stow last year, was happy to have Robert, 14, join the Spartans. Plans are already under way to get ready for the 2015 season. The team begins practicing next week to prepare for the Second Annual “Play for Will” game between the Spartans and Nashoba staff, tentatively scheduled for Friday, May 23, at 7 p.m. The event is a fundraiser for Team Tepper’s walk in the Relay for Life and the Tecumseh Foundation, started in memory of Will Hurley. Will’s brothers, Ben and George Hurley, are assistant coaches on the Spartans along with James Ryan, Ryan Fowler, John Conry and Mark Melone. The organizers are seeking corporate sponsors to advertise on the event T-shirts as well as to provide general donations. Anyone interested can reach Aylward at brendan.aylward7@gmail.com.